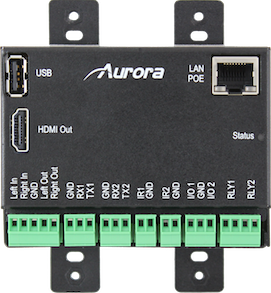 News - Join Us For CEDIA 2014 | Aurora Multimedia Corp.
Aurora Multimedia announces three single-package One Room – One Cable™ kits. These kits will ship complete with 2-ceiling tile speakers, dual-input HDBaseT Wall Plate switcher, HDBaseT Receiver with 2x35W amplifier and a pre-programmed 8-button in-wall control panel. This One Room – One Cable™ kit only requires a single cat-cable between the switcher and the display making installation a snap. The three kits ORC-1, ORC-2 and ORC-3 make specifying, ordering, deploying and installing easy, organized and streamlined. Each kit is based around Aurora’s award winning DXW-2 Series keypads. Industry 1 st Platform Agnostic web-server control platform for Tablet integration with no Apps or License fee required. Industry 1st Platform Agnostic web-server control platform for Tablet integration with no Apps or License fee required.